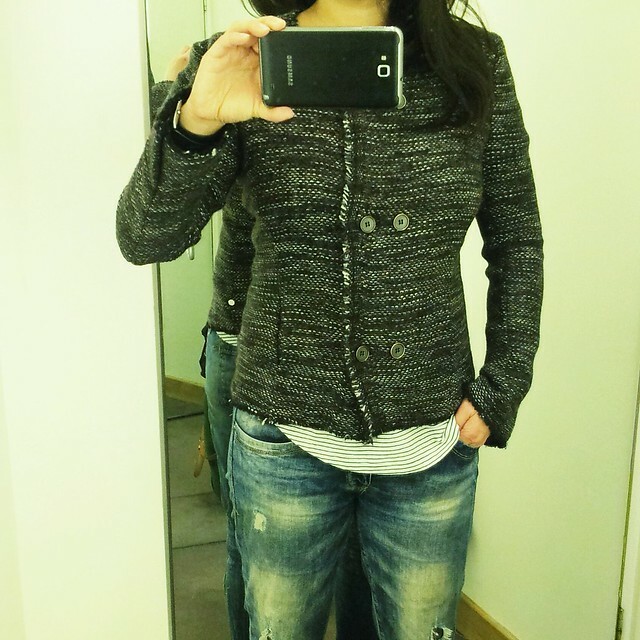 A couple of weeks ago, I popped into Selfridges to check out the Lali jacket from Isabel Marant's latest Spring/Summer collection. 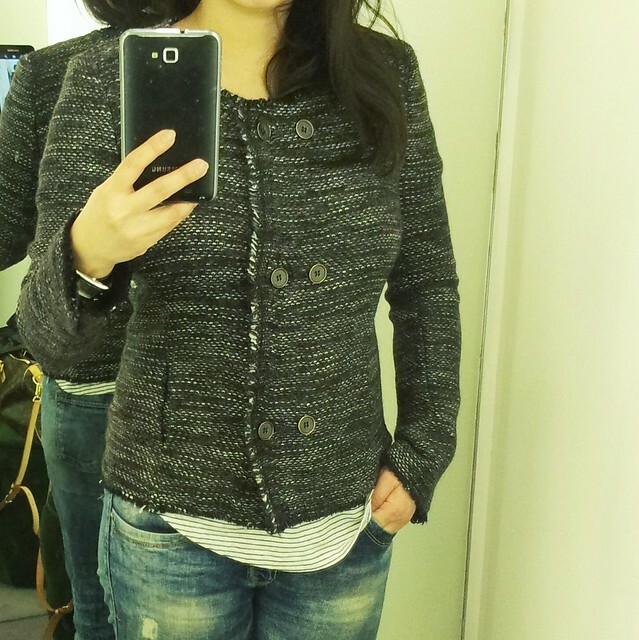 It didn't help that I was trying on a thick jacket in a dinky overheated fitting room with sweat pouring down my face. Why do most high end stores have such rubbish fitting rooms when their main aim is to sell clothes? I could barely make out the jacket because it was so dark. ok, ok.....#rantover. The fit was disappointing with the jacket hugging my torso in all the wrong places, particularly when it was buttoned up. 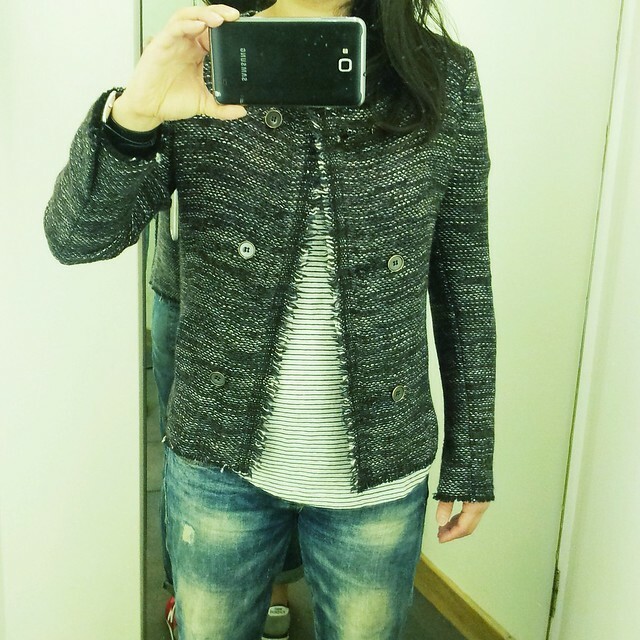 I've got my eye on Isabel Marant Laure tweed jacket for a while now. Being a dirt magnet, the lighter version is a big no no for me. At £415, it's not cheap but then again, it's nowhere near as pricey as a Chanel jacket. I tried on my usual size (EU 38) and the fit was perfect. Very flattering too, I might add. I know I've banged on long enough about the lack of lining in most of her jackets so I'm resigned to the fact that this may be a permanent thing now. I personally wouldn't wear it without a long sleeve t-shirt underneath or else I'll be scratching myself silly. Wow - it looks great on you! I'm so addicted to these jackets! The jacket looks just perfect on you. The frayed edges give it a slightly more relaxed feel to an otherwise very square/formal cut. I like it! I have tried this jacket aswell and found it really itchy. I agree with the lack of linings, disappointing for such a high price. Well I have to say it looks divine on you - this is more the Marant styling I like rather than the more bohemian designs. Very sharp. I'd love one!